Prepare For Your Child’s First Dental Visit With Us! Irvine and San Juan Capistrano Children’s Dentistry proudly serves families with children as their local pediatric dentist. It is important that parents and guardians incorporate healthy oral hygiene practices at a young age. We believe, along with the American Academy of Pediatric Dentistry, that children should visit the dentist after their first tooth erupts and no later than age one. There are many questions that you may have about dentistry for your child and what you should be doing as a parent. Our doctors and staff believe it is important that parents and guardians are well informed about the best pediatric dental practices. At age one, we generally just do an initial exam. If your child is two and a half years old or older, your doctor, if necessary, may recommend a cleaning and X-rays. Also, if your child is three years old or younger, they can sit on your lap during the exam and watch our TVs on the ceiling. We do all that we can to assure that you and your child have a pleasant experience. Please let us know ahead of time if there is anything we can do to better accommodate your child to make this a positive dental visit for him/her. We know that the attention span of young children can be short, so we conduct a thorough examination as quickly as we can. Please do not avoid your child’s dental visit because you are concerned he/she will not cooperate. Our dental staff if highly trained to work with children. It has been proven that children who start dental visits early on are more likely to have positive views about dental visits in the future. It is far better to get an early start on a prevention program for your child to catch minor dental problems that can be addressed and avoid major problems in the future. For example, decay. Decay grows slowly, but if caught and treated early, therapies can be implemented and used to reverse or minimize the negative effects of tooth decay. Tips For A Great First Dental Visit! Have your child watch our office video and view our office photos! 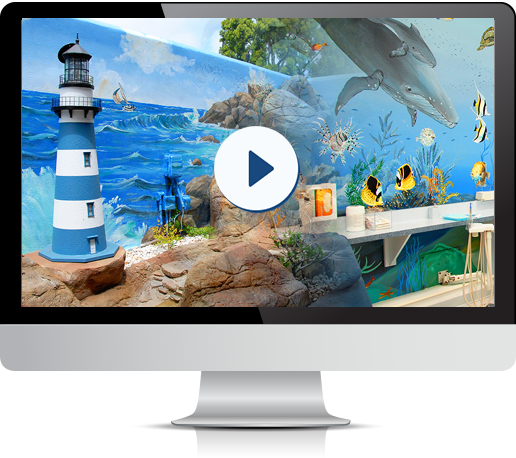 Many of our patients get excited to come see us after watching our video and viewing photos of our child friendly offices. Schedule an appointment time when your child is alert and well rested. Children five years old and younger tend to be more cooperative earlier in the day. Try to avoid scheduling around or during your child’s routine nap and meal times. Before your visit, explain to your child that the dentist will count his/her teeth and make sure they are strong and healthy. We would also like to encourage you to role-play with your child beforehand and pretend with your child as they lie on a flat surface as if they were in our dental chair. Read your child a story about a character that has a positive experience with the dentist. There are several children’s books available about “First time visits to the dentist” that can be found at any local bookstore. Please use positive language around your child when discussing his/her dental visit. Refrain from using words that may cause unnecessary fear such as hurt, pull, drill, shot, etc. Do not let others tell your child negative stories about dental visits an do not let your child know if you feel anxious about going to the dentist. Children are more intuitive than we give them credit for! An anxious parent or guardian can cause unnecessary anxiety for the child. Be a good role model for your child to brushing twice a day, flossing every night, eating healthy and visiting the dentists regularly. If your child is three or older an he/she is scheduled for their first dental cleaning, it can be helpful to get your child an electric toothbrush so that he/she become accustomed to the noise and the feeling of vibration on their teeth. Thank you for choosing Irvine Capistrano Children’s Dentistry for your pediatric dentistry needs. Please contact us with any questions or concerns you may still have. To schedule your first visit at our Irvine office, please call (949) 786-0800 or for the San Juan Capistrano office, please call (949) 661-3380. We look forward to adding you to the Children’s Dentistry family and joining you and your child on your dental journey!